Canning and freezing is something I feel like I am still navigating the waters on. But, canning is starting to come easier and easier to me every year. I finally have a few of my favorite canning recipes that I use every year. And I feel confident with my canners to even try new things. This year I decided to try peaches. I was a little worried at first with canning fruits- but I bucked up and made it happen. Here in South Dakota we have fruit truck deliveries through the summer. It’s so, so delicious and the only downside is you have to buy in huge bulk! 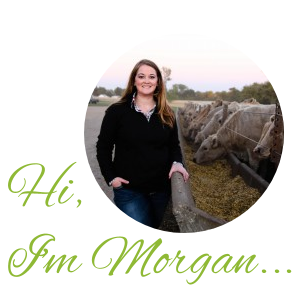 But, with my confidence in canning and also my love of sharing with family and friends it wasn’t daunting to me at all this year. 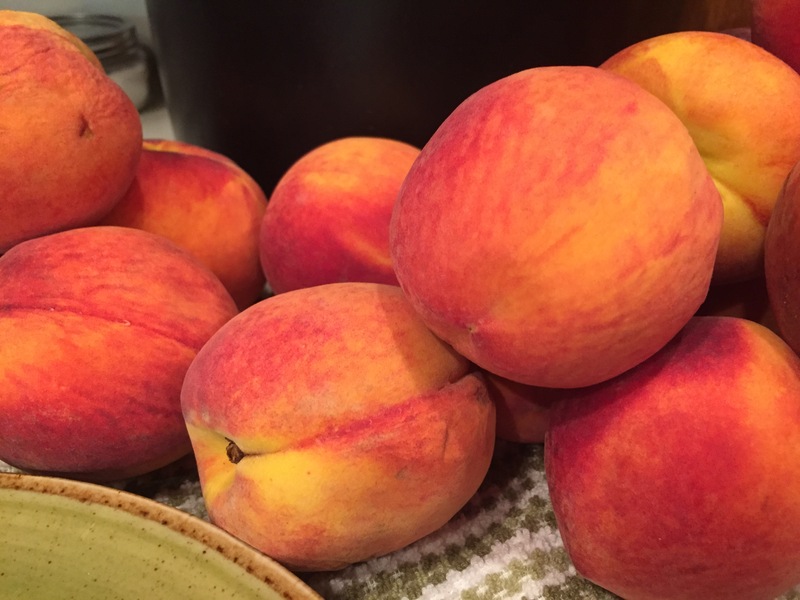 I love peaches, and Elliette loves peaches most days, so I decided to purchase a box- and I almost wish I had gotten more. But, I thought this was a good place to start when it comes to canning. Not too much to be overwhelming, but enough worth canning. This blanching step made it super, duper easy for me to peel off the skins. And then once the skins were off I sliced up my peaches. Now, my slicing skills are not that pretty. But, hey, it all eats the same! And, I had a three year old that was so super helpful the whole time. So, I did what I could. 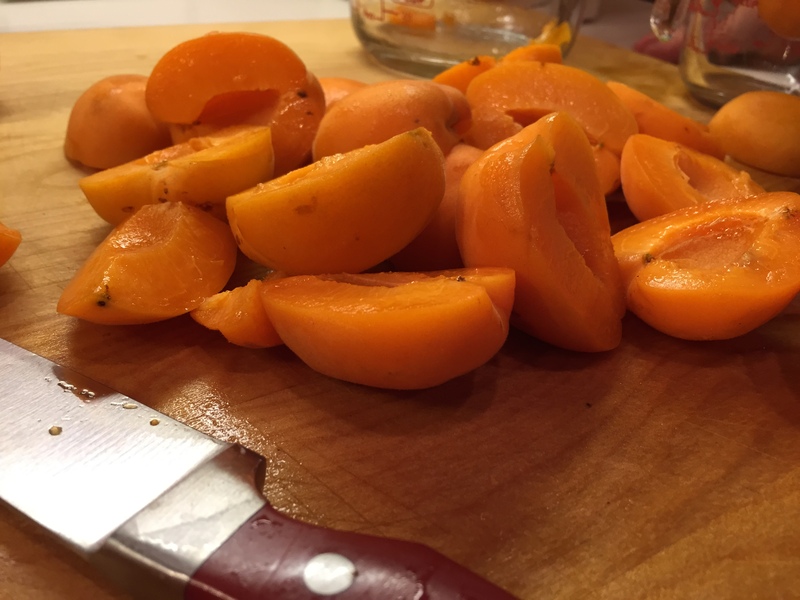 And some of the peaches were blanched a bit longer than 40 seconds because three year olds always need something… After slicing them up I went back through and sliced off some of the darker spots that didn’t look as fresh. When it comes to canning, freshest is bestest! Or fresh is best, if you need some proper English in there! When I got done slicing I put the peaches in a bowl with lemon water. This is something I do for a lot of things- to keep the produce from browning on you. If I know I have a super busy day the next day, but it’s my week to cook on the farm and I know I want to make mashed potatoes I will get them ready the night before and put them in the refrigerator soaking in water with a splash of vinegar. With fruit- lemon water. With veggies- vinegar. When I was done slicing I got my water and sugar boiling. 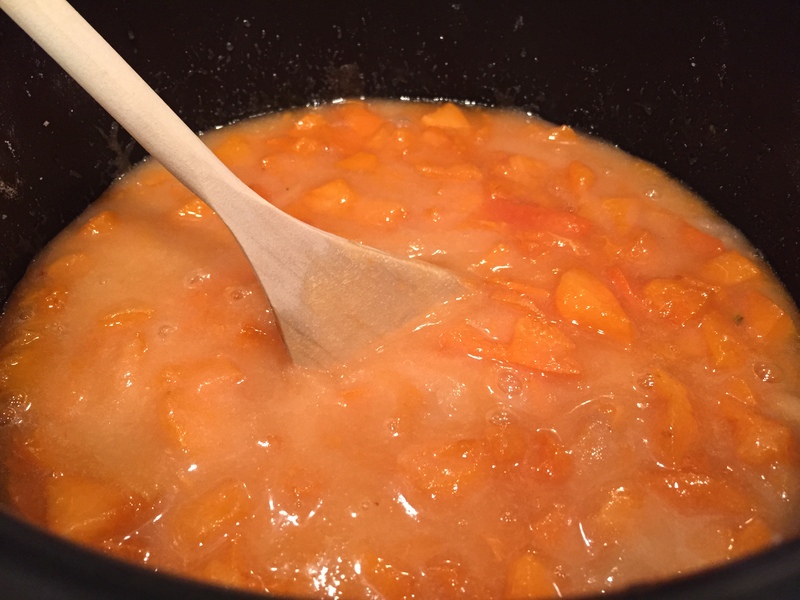 I did 3 cups of sugar with 6 cups of water to make my “peach syrup”. And then I drained my peaches from the lemon water and added them for about 6 minutes, this is a hot pack method. If you want you can add the fresh peaches straight to the jars and then pour syrup right on top of them, but I chose to do it this way. It is totally up to you! 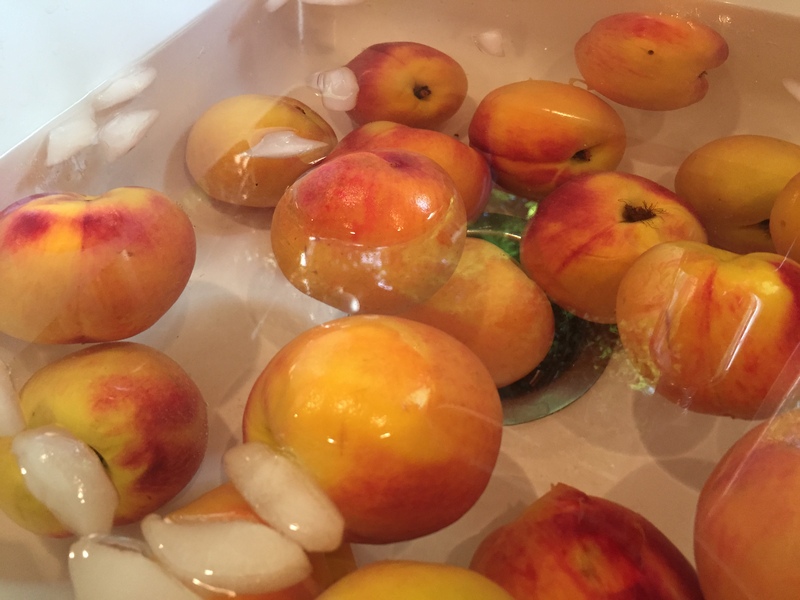 Once my peaches were all in the jars I put my lids and rings on and them, turned them tight and processed them in a hot water bath canner for about 25 minutes. Then I pulled them out, let them cool, and added them to my beautiful canning area that my hubby made me this last winter. I encourage anyone to try canning. It’s a great way to preserve that garden or to take advantage of yummy fruit trucks in your area! The whole process can seem a bit intimidating, but it really can be worthwhile. And there is a sweet, sweet feeling of satisfaction when you are all finished for the season and your shelves are full. And now with the wonderful internet you can find thousands of recipe ideas and safety tips. 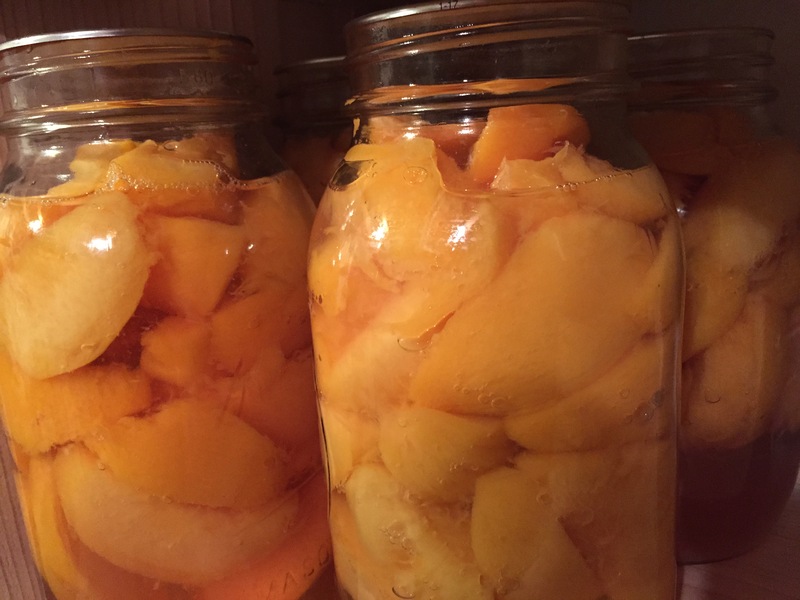 My family loves canned peaches (and pears) too! Since I don’t have a garden this year I’ll only be canning a little bit and peaches is one of the things I’ll do since I can get lugs of them through the Lion’s Club back home. So sometime this month I’ll be doing the same thing! 🙂 Good job!